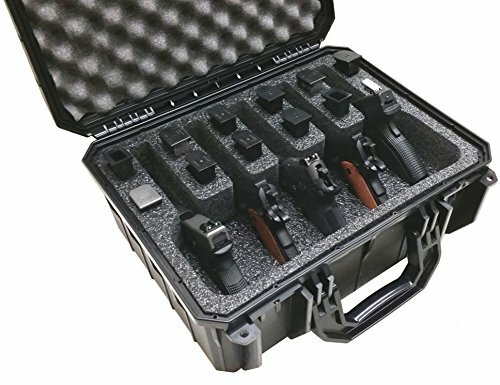 This multiple pistol case holds up to 5 pistols with 11 extra magazines The 5 pistol case is 100% Waterproof, Dustproof & crushproof. Hydro absorbent silica gel included to prevent rust. Foam insert is (closed cell) military grade polyethylene which can be wiped clean. This five pistol case is padlockable. This multi pistol case is Airline Approved for checked luggage. Quick draw design allows quick access. Compact design leaves no wasted space. Max length of pistols is 8 5/8". This hard pistol case is not intended for revolvers or snub nose pistols. (See our 5 Revolver & Accessory Case which properly fits revolvers). These universal pistol cases are manufactured in America by Case Club. Pistols & shooting gear depicted in this gun case are not included. Be sure to check out all our universal multiple gun cases!